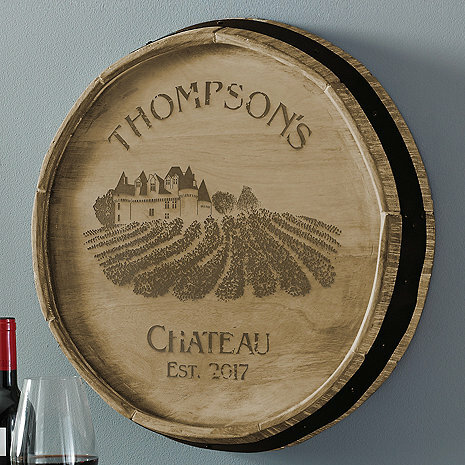 Show your love of the wine lifestyle with this Personalized Quarter Barrel Sign. Handcrafted of natural oak with metal ring. Can be personalized with Name and Year. Is the black lettering and picture raised or flat on the barrel face? BEST ANSWER: It is engraved into the wood. Almost like it was pressed, or burned into the wood. It is good quality and classy looking.. Yes, it is like it is burned into it. Just Love it! Great purchase! Is this available as a lazy susan? BEST ANSWER: Susan, we are currently not offering this design on our Lazy Susans. Thanks! It was a present for my boss and his wife. Absolutely gorgeous. They loved it. They are building a wine room. I gave them my magazine. Will irder from you again and again. Our purchase was a gift and it was perfect! It meant so much to our friends and it fit perfectly in their home. It has become the talk of parties. People LOVE the idea and always ask where they got it. It was made of good quality and shipped perfectly. We will probably purchase more for other friends and give them out as gifts. It is something so simple but meaningful to the recipient. Thank you!! Can't wait to hang it in our bar area. Love that we were able to personalize it. We bought this to go above a wooden wine cabinet. This looks perfect above the bar!! Love it! Beautifully designed! Sales representative was extremely helpful and made sure it was engraved correctly! This was a weddings gift and the happy couple loved it! If you’re looking for a unique and special gift for someone or yourself, this is it! Monogrammed with their name and date of the occasion, it’s a one of a kind piece! Very well made! It was an anniversary gift for my sister and brother in law celebrating 40 yrs. They live on a vineyard so very fitting, they loved it, plus he works for a winery. We love it. Looks great on the wall. Shipped pretty quickly. Good quality. Awesome piece to any home!!?? Love this. Beautiful and so happy with the quality!!?? Gave this to my son and daughter-in-law for their wine cellar. They absolutely loved it. It was personalized and delivered in a timely manner and was very easy to order. Customer service was very friendly and answered any questions easily. Would order anything again from them!!!! They have a wide selection to choose from.